Bringing me up to date at last (barring a couple of Revisitations remasterings), here is my cover for this month’s release of Planet of the Spiders – hopefully not too freaky for any arachnophobes! Download from Velvet Jacket here and read about its creation here. More Pertwee to come next with the re-release of Spearhead From Space with its sequel Terror of the Autons, after which it’ll be the final Davisons (aww) with The Awakening and Frontios. Held off watching Planet of the Spiders (not so hard) to finish The Seeds of Death: download; notes. Here’s my alternative cover for Kinda. It would have been completed last weekend, but I was lured away from the computer by the sudden sunshine (gotta make the most of what we get here in the UK!). Anyway, download here and read about it’s origination here. 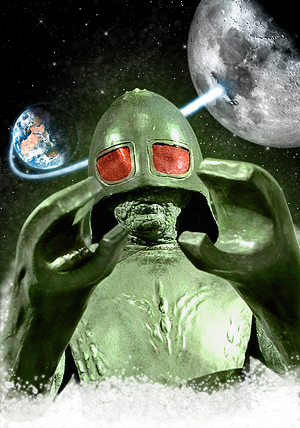 If I can hold off watching the new DVD of Planet of the Spiders for another day (shouldn’t be too hard), I hope to get The Seeds of Death remastering finished tomorrow. Or I may start on the Spiders cover, as I have a pretty good idea in mind of what I’ll do for that. I’m working on both Kinda and The Seeds of Death this weekend, so don’t know if either will be finished in time to post this evening, but here’s a preview of the remastered Seeds illustration so far – just the Doctor to add.